Standing alongside President Raúl Castro on Monday during his landmark visit to Cuba, President Barack Obama said, "For more than half a century, the site of a U.S. president here in Havana would have been unimaginable, but this is a new day." He then added in Spanish, "un nuevo dia." However, Obama also made it clear in his speech that, "We continue to have some very serious differences, including on democracy and human rights." After speaking with Castro at Havana's Palace of the Revolution, Obama made it clear that the United States would not try to intervene in Cuba. 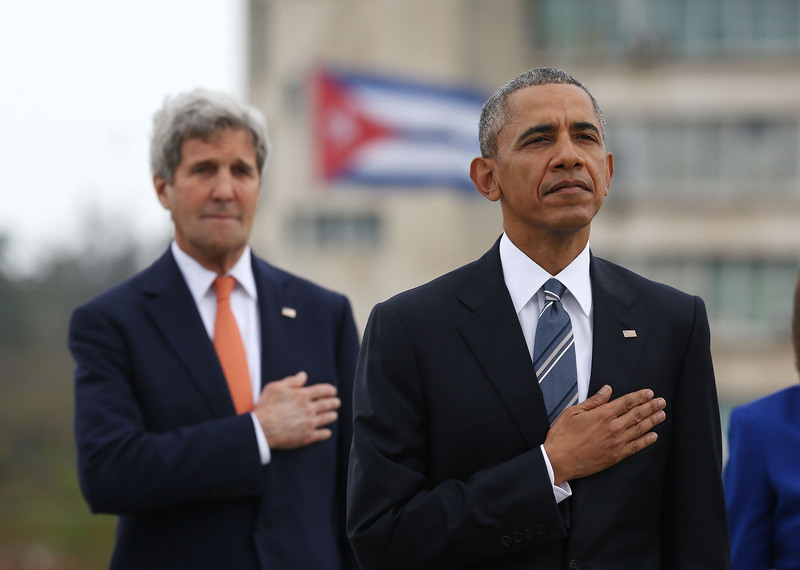 "Cuba's destiny won't be decided by the U.S. or any other nation," he said. "The future of Cuba will be decided by Cubans." He played up how "normalizing relations" between the two countries provided more opportunities for both Americans and Cubans, even playfully bringing up how he is looking forward to Tuesday's baseball game between the Tampa Bay Rays and the Cuban national team. Still, when questioned after his speech, Obama stressed that "Americans believe in democracy," including "freedom of speech" and "freedom of assembly" and that these were "not just American values" but ones that came from "the human impulse." Overall, though, Obama appeared more optimistic and friendly than his Cuban counterpart. The U.S. president concluded his speech on Monday saying, "We're focused on the future, and I'm absolutely confident that if we stay on this course, we can deliver a brighter future for the American people and the Cuban people." He added later that, the United States should "welcome" the Cuban government commenting on national policies. Meanwhile, Castro spent a good portion of his speech calling out what he perceived as "double standards" in the American human rights record, taking the jabs at the U.S. for its healthcare and educational systems. Castro exhibited his own hypocritical nature and rather awkwardly denied the presence of political prisoners in his own country. When he was questioned by multiple reporters on this issue, he said they should give him specific names and criticized the journalists for asking him about political prisoners at all. Moreover, Castro was adamant that the embargo must be lifted for there to be concrete progress. Castro also called on Obama to abandon the U.S. base at Guantánamo Bay. "In order to move forward towards normalization, it will also be necessary to return the territory illegally occupied by Guantanamo Bay Naval Base."